Colordarcy features in What House? – New Investment Offers ‘Property Without Mortgage’. 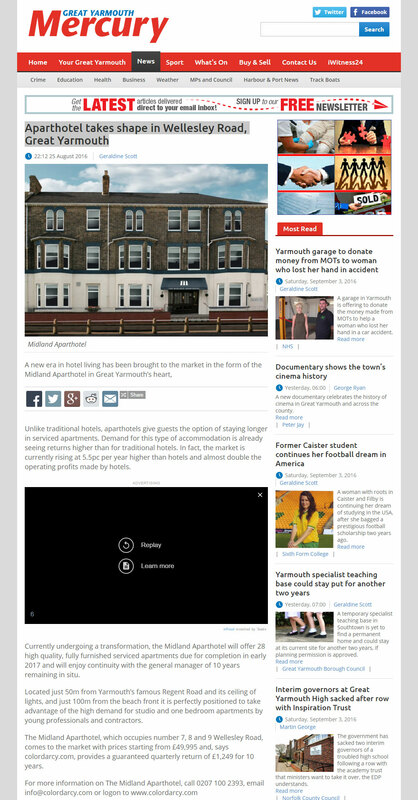 Colordarcy features in Great Yarmouth Mercury – Aparthotel Takes shape in Wellesley Road, Great Yarmouth. 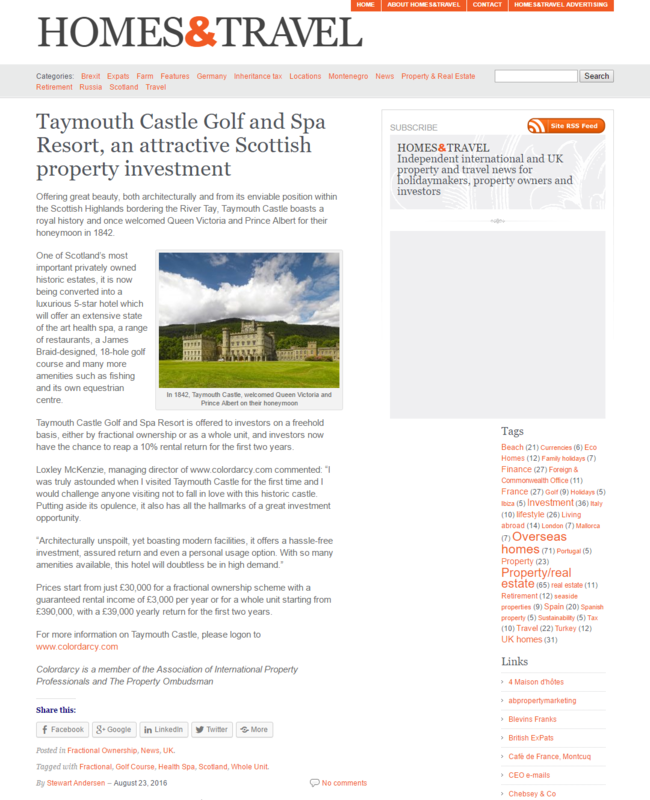 Colordarcy features in Homes And Travel magazine – Taymouth Castle Golf and Spa Resort, an attractive Scottish property investment. Taymouth Castle refurbishment is featured in the Sunday Times. Colordarcy features in South China Morning Post news article – Sport raises housing stakes in Brazil. Colordarcy features in The Property Guru magazine in Singapore – Brazil Wins Property World Cup. Colordarcy features in Property Showrooms article – The Most Attractive Market for Property Investors. Colordarcy features in OPP Connect article – Investment firm colordarcy has announced its WORST markets of the year and offers some predictions for 2014. Colordarcy features in Property Overseas Today news article – New Florida real estate investment guide. Colordarcy features in Investors Hangout – Property investment company Colordarcy highlight the latest research from Gyoder, which shows that once again property prices were on the rise in Istanbul in 2012. Colordarcy features in Benzinga – Colordarcy highlight the latest Zillow data which reveals that property prices increased by 5.9% overall in Orlando in 2012, however there are micro markets within Orlando that grew considerably more including Metro West. Colordarcy – Key Ready Or Off-Plan Istanbul Property? Which Is Best? Colordarcy contributes to article in Internet Profit Packet – Key-ready or off-plan Istanbul property? Which is best? Colordarcy features in iExpats.com news article – Dutch property prices in five-year freefall. Colordarcy features in Benzinga.com – Don’t have nightmares about paying tax on property abroad. Colordarcy features in International Business Times – Don’t have nightmares about paying tax on property abroad. Colordarcy features in Yahoo! News – Over 50 and worried about financial security? Colordarcy.com offers a solution. Colordarcy features in Investor Today – Colordarcy reveal five worst property markets of 2012. Colordarcy features in Yahoo! News – Colordarcy reveal a real estate investment opportunity investors won’t find at home. Colordarcy contributes to Yahoo! News article – finding the bottom property price – the secret to making money from property.